No matter where you find yourself laying your head for the night, a good night’s sleep is essential for enjoyable and productive daytime activities. Just because you are outdoors and away from your comfortable bed doesn’t mean you have to endure miserable nights. If you’re an avid outdoor adventurer, a quality sleeping bag is a must have and one of the best things you can bring along on your excursions. After an enjoyable but tiring day of trekking, hiking, biking, kayaking, or any other exploration, you will be able to get a good and relaxing night’s sleep and wake up ready to go again and get the most out of your favorite pastime. Because quality sleep is very important and a sleeping bag lasts for years, investing in the best sleeping bag you can afford is well worth it. Find the perfect sleeping bag for warm and cozy nights away from home among the top picks we’ve reviewed below. They range from the most comfortable sleeping bags for car camping to snugly, packable and lightweight sleeping bags that strike the perfect balance between warmth, weight, and suit backpacking and hiking. All are highly rated by outdoor enthusiasts and offer great value for money. Our buying guide explains the specifications and features you will come across when evaluating different options and offers guidance on making the right choice. First on our list is this lightweight, quality, warm, comfortable, versatile, and attractively priced 3-season mummy bag by Winners Outfitters. 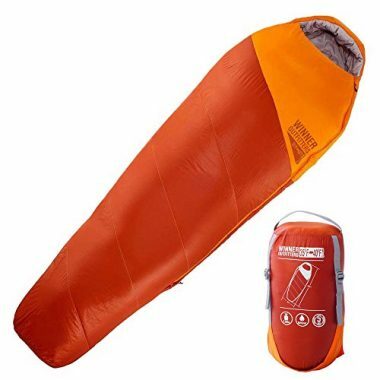 With all these great features, it is no surprise that this is a top rated sleeping bag for camping, hiking, backpacking, kayaking, and other outdoor travels in the summer, spring, and fall. This bag will keep you very warm in temperate conditions ranging from 40 to 50 degrees. The snug fit and draft collars and tubes enhance insulation. The adjustable hood keeps your head warm and you can insert a pillow for even more cushioning and comfort. The double zipper design allows you to unzip the bottom or top if it gets too warm and you need to let some cool air in. This is a well made and durable bag using high quality materials - water resistant polyester shell, polyester lining and cotton, and hollow fiber filling. The SBS zippers are strong an heavy duty. Packability and portability are excellent. The bag is only 3 pounds, it shrinks to a very small size using the included compression sack and fits in a pack easily. The only con is that it is a bit narrow and can feel restrictive especially for larger campers or those who have a relaxed sleeping style. This lightweight sleeping bag by Abco Tech will keep you comfortably warm and comfortable when sleeping outdoors in 30 to 50 temperatures. Used together with a liner and bivy, it can also keep a well-layered warm sleeper comfortable at the lowest rated temperature of 20F. It works great for camping, backpacking, trekking, hiking, traveling and other outdoor activities in the summer, spring, and fall. The polyester used in its construction is comfortable and durable. The polyester lining feels good on the skin and is good at wicking moisture from sweat preventing a slick feeling. The polyester fill dries quickly so it performs well in wet conditions. Double fill technology and quilted design enhance the insulation. The barrel-shaped design is roomier than a mummy design for comfort while keeping the size and weight down. This is a lightweight bag that compresses into a compact size making it easy and convenient to carry even when trekking or hiking on foot and a pack on your back. The best sleeping bag doesn't have to have an expensive price tag attached. This affordable yet good quality rectangular sleeping bag by Coleman is designed for comfort. Its "comfort zone" temperature range is 50 to 70F making it the best sleeping bag for camping in warm conditions if your height is up to 5 feet 11 inches tall. It will keep you cozy and the double zippers allow you to open one side for cooling if you get too toasty. You can also open it up fully and use it as a blanket or quilt. It is also ideal for indoor use for guests and sleepovers. With its roomy rectangular shape, you will have plenty of wiggle room and won't feel restricted in there. The polyester liner is very soft, feels very comfortable on the skin and is good at wicking away perspiration. The edge of the bag that comes into contact with the face is made of a plush material that feels soft and comfortable on the face. The zippers have a snag-free opening and closing. 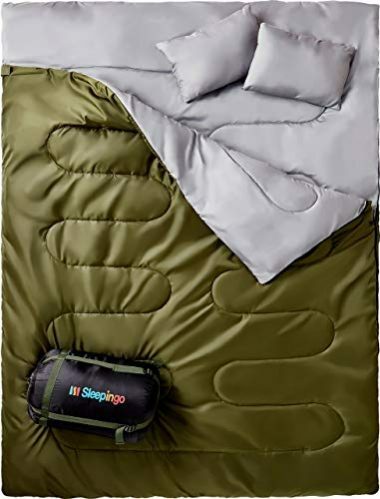 As a double sleeping bag, this Sleepingo is a roomy queen size sleeping bag for two adults to fit in and sleep comfortably without feeling constricted. It also separates into two individual sleeping bags suitable for adults or teens. If you are looking for a double wide sleeping bag for mild weather, you can't go wrong with this one. It is a lightweight and top rated sleeping bag for camping that also suits hiking, backpacking, traveling and even snuggling with the kids in the living room or backyard. With a 32 degrees Fahrenheit temperature rating, it provides a comfortable place to sleep in when the weather is nice in the summer and when temperatures start to drop into the 30's. It is very well designed and constructed. The tough, water resistant exterior ensures the inside stays dry when camping in wet conditions. The inner lining made of a soft tetron and cotton combo is soft, warm and comfortable on the skin. For its size, it is surprisingly lightweight and easy to transport. It comes with a compression bag and packs down to a small size. The two travel pillows it comes with are a wonderful bonus. 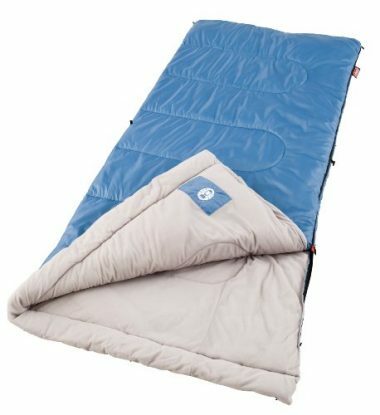 With a 0-10°F temperature rating, an extremely thick and plush quilted construction, a snug fitting mummy design, a snug adjustable hood, an insulated footbox, and Thermolock draft tube for insulation efficiency, this mummy sleeping bag by the reputable Coleman brand is the best sleeping bag for cold weather. It is extremely warm and adequately insulated to keep you warm and comfortable down to about 15 degrees. In fact, you may find yourself getting too warm and needing to let some cool air in. It is long enough and has plenty of room to comfortably accommodate frames up to 6 feet 2 inches in height. It is designed to fit snugly so as to trap warm air inside. It may be tight and restrictive for a larger person. At 5.8 pounds, it is on the heavy side but this is justified by the high level of insulation. It is perfect for car camping in cold conditions. For backpacking and hiking, this bag is on the bulky and heavy side and would be a burden to carry. 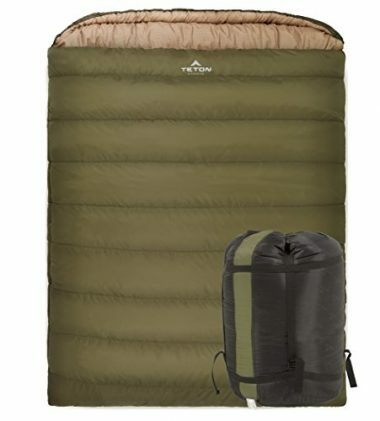 The Teton Sports Celsius XXL is the best sleeping bag for camping in cold weather. It is extremely warm and comfortably spacious with plenty of room for breathing and movement. SuperLoft Elite hollow fiber fill, double-layer construction, zipper, and shoulder draft tubes provide adequate insulation for even zero degree weather. Its lowest rating for survival is -18°C/0°F. The mummy style adjustable and elevated hood keeps your head comfortably off the ground and warm and your pillow clean. If you need a sleeping bag for cold weather car camping but find mummy bags to be too constricting and uncomfortable, this is the best sleeping bag for you. The oversized rectangular design is wide and long enough for even a large, tall man to fit comfortably, an average sized person to have a lot of room to turn and toss and it can even fit two campers snugly. You can join two bags together via left and right side zippers to create a double sleeping bag for two to snuggle in. The quality level is premium and this sleeping bag is built to last. The outer shell is a tough and durable taffeta fabric. The flannel lining feels warm and comfortable on the skin. It unzips on each side and the taped and strong zippers roll smoothly without snagging. It is lightweight and packs down to a small size into the compression sack provided making portability easy. Tip: Refrain from machine washing this sleeping bag. Doing so will degrade the insulation and void the warranty. You can always count on Teton Sports for the best sleeping bags for camping and cold weather. Their bags are outstanding in terms of quality, warmth, comfort, and versatility. 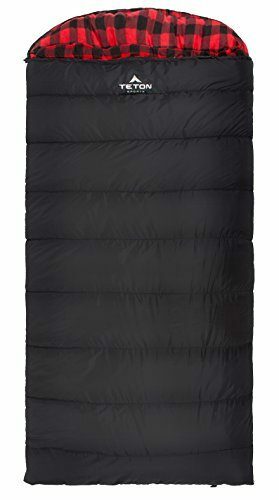 This Mammoth double sleeping bag is soft, warm, spacious and comfortable. It is ideal for couples and family car camping adventures in cold weather. With a zero degree temperature rating, the amount of insulation on this bag is substantial. You will feel comfortably warm even in frigid conditions. To preserve warmth and block the freezing cold, it utilizes a double-layer build, SuperLoft Elite hollow fiber fill, shoulder and zipper draft tubes, and drawstrings at the shoulder and around the head. The roomy design, soft feel, excellent warmth, and non-allergenic construction ensure comfort is not an issue with this sleeping bag. It is very fluffy and the lush flannel inner lining feels incredibly soft on the skin. The elevated hood design raises the head off the ground. If you find yourself too warm, the bag unzips on both sides and corners. Size wise, this double sleeping bag is longer and wider than a queen-sized mattress. There is adequate room for even larger and taller sleepers. It is ideal for couples who want to cuddle up and snuggle. The bag also separates into two individual quilts. On the downside, this bag is huge, heavy and bulky and strictly for car camping or indoor and backyard use. It is not meant for hiking or backpacking. Another complaint is that it is not easy to fit this bag into the compression pack it comes with. The good thing is that the company provides instructional videos and it gets easier with practice. This Teton Sports Celsius XL with a temperature rating of -32°C/-25°F is made to provide warmth and comfort in the coldest conditions. It is the best winter sleeping bag for car camping in winter and in extremely cold places. In addition to being well insulated, it is spacious so it doesn't feel restrictive like a mummy style sleeping bag does. Its roomy with enough space for taller and larger guys and those who have a relaxed sleeping style to be comfortable and move around. This does more than help you survive below freezing temperature. It will keep you warm and comfortable even in 10 degree or lower temperatures. Warm air is kept inside the bag and cold air outside by the brand's SuperLoft Elite hollow fiber fill, double-layer offset stitching, zipper and shoulder draft tubes, staggered seams, flannel lining, and mummy hood. Comfort is ensured by the fluffy insulation, roomy design, soft poly-flannel lining, elevated mummy hood design, and double zippers for ventilation. Teton Sports makes quality, durable yet accessibly priced camping and outdoor gear. A tough and durable ripstop outer fabric and heavy duty, taped zippers that roll smoothly ensure this sleeping bag will keep you warm in the cold for a long time. Keep in mind this is a big heavy bag that's ideal for cold weather car camping It is not a backpacking or hiking bag, as it is on the bulky side. It comes with a compression sack for carrying convenience. 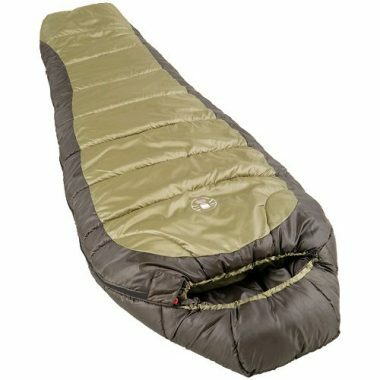 Looking for an ultralight sleeping bag that is comfortable and affordably priced? At 1.7 lbs, this Ecoopro sleeping bag is one of the lightest sleeping bags out there and could be the best backpacking sleeping bag for you or easily portable compact sleeping bag for your kid. It also suits scouting, hiking, and camping in warm and humid temperature conditions as well as traveling and sleepovers. Its temperature rating is 48 to 59℉. It is very thin and practical for summer use. It will keep you comfortably warm, cool and dry by ensuring you don't get too hot, sweaty and slick. It also unzips and doubles up as a comforter. It is designed for use by kids, teens, and adults. It has a nice width and length but may not be roomy enough if you are tall, large, or have broad shoulders. Construction quality is good. It features a weather and water resistant nylon interior, 100% polyester and TC cotton lining that is soft, comfortable on the skin and helps wick perspiration away from the skin. 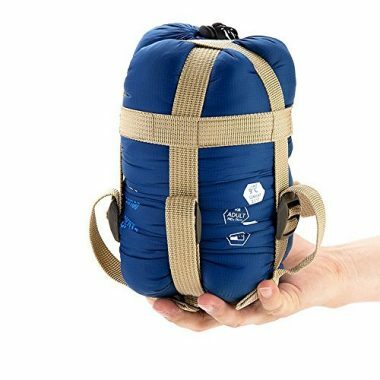 It is easy to roll up into the carrying sack and compresses into an amazingly small and lightweight package that takes very little space in a backpack and is convenient for travel. 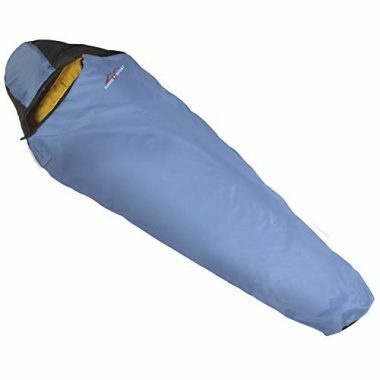 If you want a compact sleeping bag that is easy to pack and carry but not at the expense of warmth and comfort, you can rely on this mummy sleeping bag by Suisse Sport to keep you very warm and cozy in 40-55 degrees temperatures. Its lowest temperature rating for survival is 30 degrees. This is a lightweight sleeping bag perfect for hikers, backpackers, bikers, travelers, and campers who prefer to pack light. We love how small it gets when compressed and fitted into the compression stuff sack it comes with. You can fit it in or attach it on your pack easily. Packing it down to a small size does take some practice though. To ensure you stay warm and protect you against the harsh elements, it utilizes a cushioned and snug fitting mummy design, double layer offset quilt construction, contoured head design, adjustable hood and neck, and a draft tube for insulation. It may look narrow in the picture and like it may be restrictive but this mummy sleeping bag is a standard adult size. Its pretty spacious and most people find it comfortable. As for quality, this is a well made bag that should last a good number of years. Its inexpensive pricing makes it a fantastic value given its quality and comfort level. On the inside is a zippered pocket for keeping valuables such as cell phone, keys, and wallet. Comfort is essential for a good night’s sleep especially when you’re sleeping in a tent under the stars. Comfort, is, therefore, the number one consideration when buying a sleeping bag. A good sleeping bag feels good on your skin and creates the ideal conditions for you to fall asleep no matter how cold it is on the outside. First of all, ensure it is adequately insulated to keep you comfortably warm and dry in the temperatures you will be sleeping in. The challenge you face here is that the most comfortable bags are usually the heaviest. If you’re car camping, space and portability aren’t limiting factors and you can bring along a large, fluffy and heavily insulated sleeping bag that is as comfortable to sleep on as your bed is. You can choose rectangular bags or spacious mummy bags. For backpacking and hiking, you need a comfortable sleeping bag that strikes a balance between weight and warmth and is packable. A slender, form fitting mummy bag that is lightweight and compressible is ideal. If you will using your bag in the summer, a lightweight and thinly insulated sleeping bag will be the most comfortable. The materials a bag is made of also affect how comfortable it is. Ensure the inner lining is made of a material that feels soft and comfortable on the skin and helps wick away perspiration. Some sleeping bag materials such as down, wool, and cotton are known to cause allergies. If you’re sensitive to any of these or any other fabrics, check for their presence in the sleeping bags you’re considering. The design of a sleeping bag plays a very important role in the warmth and comfort it provides. Traditionally, sleeping bags for camping have a roomy and comfortable rectangular shape that offers plenty of room for turning and tossing. Most can be unzipped to form a large blanket or function as a quilt. They suit warm environments best as they have less efficient insulation and don’t have a hood. Their large size and weight suits car camping and indoor use for guests or fun snuggles with kids. Mummy sleeping bags are innovatively designed to maximize on warmth and comfort while keeping size and weight down. They get their name from the integrated mummy hood they feature, which keeps the head warm. Their snug fit provides excellent insulation as there is little space for warmth to escape or cold air from the outside to get in. They are ideal for cold, freezing and windy conditions. The tapered design with narrow shoulders, hips and legs widths trims down material keeping them compact and lightweight for ease of packing and transport. 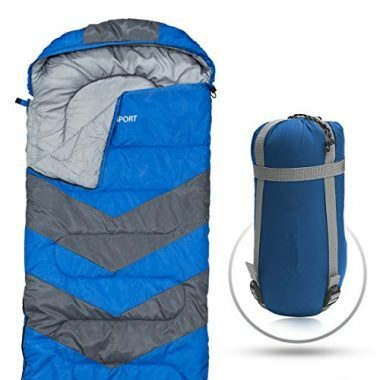 This is the best type of sleeping bag for backpacking, hiking, mountain climbing, and traveling. The downside is that the contoured design and tight fit can feel restrictive. There are some hybrid types that combine the best of both rectangular and mummy bags. These have a semi-rectangular or barrel shape. They are more efficient at trapping warmth than rectangular bags and roomier and more comfortable than mummy bags. They suit both camping and backpacking. A double sleeping bag has double the standard width and enough space for two adults to comfortably fit and sleep side-by-side without feeling restricted. Most can separate into two individual sleeping bags making them versatile. They are great for couples and families. Comfort and weight are among the most important consideration when selecting a sleeping bag. The ideal sleeping bag would be both lightweight and comfortable. This would make it easy to pack and carry and comfortable to sleep in at night. The problem is that these two factors usually have an inverse relationship. With the exception of hot weather sleeping bags, the more comfortable the bag the heavier it is. There are ultralight sleeping bags that weigh just over 1 pound, lightweight sleeping bags that weigh 2-3 pounds and heavy ones that weigh more. If you’re car camping, the weight of the bag won’t be a big issue. You can choose a large, fluffy and heavy rectangular bag that will offer you the most comfort. This also applies to bags for cabin camping, backyard adventures, and for sleepovers. If you’re a backpacker, traveler, biker, hiker or climber, a lightweight and compressible sleeping bag that packs down small, fits in your pack and doesn’t strain your back is ideal. When you’re trekking miles a day, every once counts and a heavy and bulky bag will be a burden. You will want to look for a bag that achieves a comfortable balance between warmth and weight so you can still sleep comfortably at night. A down insulated mummy offers the ideal combination of warm, comfortable, lightweight, and packable. The type of insulation a sleeping bag has also affects the weight. Down weighs a lot less than synthetic insulation and is compressible. Synthetic sleeping bags utilize thicker fabrics and more insulation so they tend to be larger, heavier and less compressible. Check the product specifications so you know how heavy the bag you’re considering is and whether it will suit your intended applications. It is your body, not the sleeping bag, that generates warmth when it is cold. A sleeping bag keeps you warm by trapping and holding a layer of warm air around your body. Your body warms this surrounding air and the bag prevents it from escaping to the outside while also keeping cold air from getting in. How efficient a sleeping bag will be at keeping you warm depends on the type and level of insulation it is equipped with. There are two types of sleeping bag insulation. Down fill insulation has a fantastic warmth to weight ratio, is compressible, and more durable. The luxurious warmth of down is hard to beat especially for cold weather camping. Being lightweight and compressible, it is also ideal for backpacking and hiking. However, it is more expensive than synthetic insulation. Another negative is that down absorbs moisture and loses its insulating ability in wet conditions. To overcome this weakness, some manufacturers add a water resistant polymer treatment. Synthetic fill insulation dries quickly and performs well in wet conditions and is less expensive than down. On the downside, it isn’t as warm as down and is bulkier, heavier and doesn’t compress well for packing and transport. The design of a sleeping bag also affects its insulating ability. A form fitting mummy design with an adjustable neck and hood has excellent insulating properties as there is less air space to heat so you warm up fast and stay warm well. A roomy rectangular bag has less efficient insulation as there is a lot of air to heat. It takes longer to heat up and the body has to work harder to generate more warmth to stay warm. The quantity of insulation determines the conditions a sleeping bag is ideal for. Sleeping bags with more insulation are very efficient at preserving warmth. They suit cold weather conditions. Lightly insulated sleeping bags are designed for summer or indoor use for sleepovers where a lot of insulation is not needed. A sleeping bag is an item you will have for years. Investing in a high quality one will ensure that it will serve you well for a long time. Pay attention to the quality of a sleeping bag to ensure you spend your money wisely. Weight and price often indicate the level of quality. It is worth spending more on a sleeping bag that will keep you comfortable and ensure you sleep well. However, the best sleeping bags aren’t always expensive. There are also quality sleeping bags that are affordable and a fantastic value. To ensure you order a quality and durable bag, pay attention to the materials used in the bag’s construction and the quality of stitching and zippers. A tough outer fabric that can resist the elements is a must have. Read user reviews and check the kind of warranty the manufacturer offers. The longer the warranty, the higher the quality level. The comfort rating is the lowest temperature at which a sleeping bag will keep a cold sleeper such as the average woman comfortable. It is the ideal temperature at which to use the bag in order to stay comfortably warm. The lower-limit rating is the lowest temperature a sleeping bag will keep a warm sleeper such as the average man comfortable. The upper limit is the temperature at which the average man can sleep inside the bag without getting too hot and sweaty. The extreme rating is the lowest temperature a bag can keep a cold sleeper just warm enough to survive the night without freezing and getting hypothermia. Summer and warm weather bags feature ratings of +32°F (0 C) and up. 3-season bags are the most versatile and usually have ratings between +10° to +32°F (-12 C to 0 C). Winter sleeping bags for camping in the snow, mountain climbing and for freezing environments are rated +10°F (-12 C) and lower. To decide what temperature sleeping bag to choose for the environment you will be camping in, first determine the coldest temperature you’re likely to encounter in the night then choose a bag with that temperature as its comfort rating. However, most bags indicate the lower limit rating. In this case, go lower by 10-15 degrees. This is because EN lower limits tend to be on the low side and indicate the minimum temperature at which you can survive in the bag without freezing. Manufacturers also make assumptions that the sleeper is well hydrated, has layered up for warmth and laid a sleeping pad. It is better to err on the warm side than on the cold and miserable side. Also, make sure you factor in issues like age, whether you are a cold or hot sleeper, where it is windy, the kind of sleepwear you will be using and the sleeping pad insulation. Beware that many hot or warm places by day turn extremely cold in the night. The materials a sleeping bag is made of determine its comfort, weight, quality, and durability. The outer sleeping bag fabric is usually a weather resistant ripstop nylon or polyester for durability. With many synthetic bags, this shell has a durable water repellent (DWR) treatment that makes water bead up and slide off rather than soak through. As for the insulation material, you have synthetic and down. Down sleeping bags are better than synthetic sleeping bags when it comes to warmth, weight, comfort, and packability but they are more expensive than synthetic ones and don’t perform well where conditions are wet. To overcome this issue, manufacturers are adding water resistant polymers to the down. Synthetic sleeping bags are more affordable than down and since synthetic materials are fast drying, they insulate well in wet conditions. In most cases, they also feature a water resistant exterior shell. However, synthetic fill is heavier, doesn’t compress well, and doesn’t feel as warm and luxurious as down. Synthetic materials like nylon also tend to get feel slick and uncomfortable on the skin. The best material for the lining should be soft and feel good on the skin and promote wicking of perspiration. Cotton, polyester/microfiber and flannel are all soft and feel good on the skin. Polyester has excellent breathability and moisture wicking properties. Cotton doesn’t handle sweat well and flannel is very warm and comfortable but on the heavy side. To sleep comfortably, most people need to lay their head on a pillow. Bags with elevated pillow designs keep your head off the ground. With some bags, the pillow design offers a space to insert a separate pillow or stuff in clothes to create an elevated and cushioned place for the head. Ensure the sleeping bag you get has the ideal pillow design for you depending on whether you prefer to bring along your own pillow or prefer a lifted pillow design. If you’re looking for the best backpacking sleeping bag for hiking or climbing, portability will be a very important consideration for you. You will need an ultralight sleeping bag that is compressible and packs into a small package that can fit in your pack or you can attach to a loop on your pack without it making your pack bulky. You have limited storage space and the need to keep your pack light. A mummy style down sleeping bag is the best for backpacking. It is warm and comfortable yet lightweight and compressible. Make sure you check the weight and packed size of a bag before you order it to ensure it will be easy to carry. For car camping, cabin camping, sleepovers or bags for guests, portability isn’t a limiting factor. Go ahead and choose a big, fluffy and roomy rectangular sleeping bag that will be as comfortable as a bed. Q:What’s The Difference Between A Car-camping Sleeping Bag And A Backpacking Sleeping Bag? A: A car camping sleeping bag and a backpacking sleeping bag differ in terms of size, weight, design, and packability. These differences are there because of the different space and portability requirements. When car camping, storage, and portability isn’t an issue. Car camping sleeping bags can be wider, roomier, and heavier than backpacking ones. Most of them have a rectangular design just like a bed. Car campers can choose either synthetic or down insulation. When backpacking, storage space, and portability are major concerns and backpackers need compact, lightweight and packable sleeping bags that don’t sacrifice warmth and comfort. The best backpacking, traveling, and hiking sleeping bags are mummy style down filled bags, as they are light in weight and compressible yet warm and comfortable even in extremely cold weather conditions. Q: Should I Buy A down Or Synthetic Sleeping Bag For Car Camping? A: With a vehicle, transporting your camping gear will be easy. Since size and weight are not a concern, whether you should buy a down or synthetic sleeping bag comes down to the climate, budget, and personal preference. You can choose down for its luxurious comfort and warmth but be ready to pay a premium for it. A down sleeping bag is the best for cold weather conditions. A synthetic sleeping bag is practical, affordable, and withstands wet and humid camping conditions better. It is not as warm as down but offers sufficient insulation for warm and moderate temperature conditions. It will keep you warm during the spring, summer and fall months. Q: What’s The Difference Between Men’s And Women’s Sleeping Bags? A: The difference between men’s and women’s sleeping bags is based on the physical and temperature differences between the genders. First of all, they differ in size and shape. Men’s sleeping bags tend to be broader and longer than women’s bags that conform to a woman’s contour and tend to be wider at the hips and narrower at the shoulders. Men tend to be hot sleepers while women tend to be cold sleepers. The ideal temperature rating for the two genders will, therefore, differ by 10 to 15 degrees. Women’s sleeping bags tend to be warmer than men’s. Some sleeping bags for ladies also have extra insulation in the upper section and a foot warmer. Some manufacturers offer gender-specific sleeping bags while others offer unisex models with women’s styles having shorter lengths and feminine colors. Q: How Do Sleeping Bag Temperature Rating Systems Work? A: It would be impossible to tell what temperature conditions a sleeping bag can withstand just by looking at its thickness or based on how snugly and cozy it looks. Sleeping bag temperature rating systems translate insulation value into a temperature range to help campers and other shoppers determine the ideal sleeping bags for the kind of temperature conditions they will be using the sleeping bag in. They offer a general guide and basis of comparison to make it easier to choose a sleeping bag with an adequate level of insulation. The rating systems usually have a lower limit and comfort rating. The comfort rating indicates the ideal temperature a bag is designed to be used in. The lower limit indicates the lowest temperature in which a sleeping bag can keep the sleeper warm enough to not get hypothermia. Most brands use the European Norm (EN) rating system but there are some that don’t use this system and just indicate the ideal and lowest temperatures their bags are suitable for. However, the rating systems aren’t hard truths, as there are many factors that affect how warm one is while sleeping. They are meant to offer general guidance. Most ratings tend to be on the low side and based on the assumptions that there is a sleeping pad underneath and the sleeper is dressed up warmly. After determining the coldest temperature you will be sleeping in, we recommend getting a sleeping bag whose lower rating is 10 to 15 degrees lower than the minimum temperature you might encounter. Q: What Temperature Rating Do You Need If You’re Car Camping? A: To determine what temperature sleeping bag you need for car camping, find out how low temperatures in your camping location dip in the night and choose a sleeping bag whose minimum temperature rating is about 10 to 15 degrees lower than this temperature so you will be warm enough to be comfortable even if the temperature takes an unexpected dip. Generally, +32°F (0 C) and up is the temperature rating for locations where even nighttimes are warm. Versatile 3-season bags that suit most seasons and conditions are rated between +10° to +32°F (-12 C to 0 C). Car camping in the winter and in freezing cold environments calls for +10°F (-12 C) and lower temperature ratings. Q: What Is Down Fill Power? A: Not all down sleeping bags are created equal. Down insulation in sleeping bags varies in quality. Down fill power tells you the kind of down quality you’re getting by giving you a measure of the loft or fluffiness the down clusters have. The highest down fill power is 900 and the lower end is about 500. The higher the fill power, the more the fluffiness, the better the insulation, and the more lightweight and compressible the bag is but the higher its price tag. The lower the fill power, the more it weighs but the lower its price. For bags with the same down fill power but composed of a combination of down and feathers, the better quality down insulation is the one with a lower feather composition. Q: How Can I Make My Sleeping Bag Last Longer? Consider using a sleeping bag liner as a barrier to protect your bag from body oils, sweat, dirt, and wear. Air it out in the sunlight during the day. After your outdoor excursions, hang your sleeping bag in a closet or garage to air it. Frequent washing isn’t necessary. Once a year or once every other year is sufficient depending on how gross and smelly it is. You can get rid of dirty spots on the outer shell by spot cleaning using mild soap, a soft-bristle toothbrush, and a wet sponge. When it is time for a full cleaning, follow the bag’s washing instructions then dry it thoroughly before you store it. Some sleeping bags are machine washable. For others, machine washing would destroy the insulation and void the warranty. This is why it is important to check and follow the manufacturer’s recommendations. 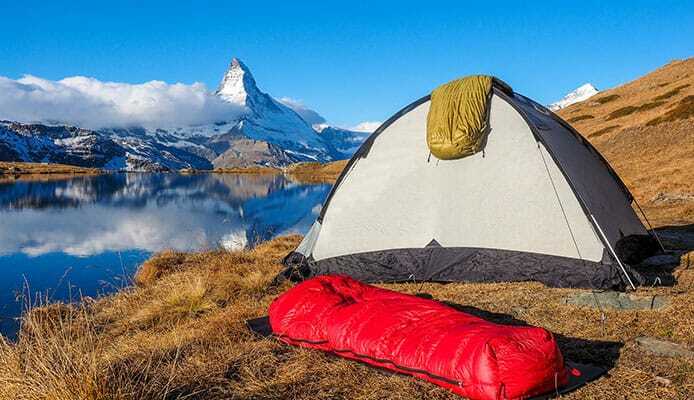 Before storing your sleeping bag, ensure it is completely dry to keep mold and mildew at bay. Hang your sleeping bag in a closet or garage or drape it over a chair or railing. You can also fold it loosely like a blanket and store in a roomy sack or pillowcase or on the shelf with nothing heavy on top. Always store your bag in a cool, dry place. The worst you can do is store your bag in a compressed form, as this will cause the insulation to deteriorate. Q: When Should I Replace My Sleeping Bag? A: Sleeping bags last for many years, even decades. With good care and maintenance, you should be able to use the same bag for a really long time. Unless you want to get a better quality sleeping bag, it should be years before your bag needs replacing because of wear and tear. Minor rips, tears and zipper issues can be fixed easily using patches, glues, and repair kits. More severe damages can be fixed by the manufacturer or a sleeping bag specialist. Q: What About Sleeping Bags Without an EN Rating? A: The European Norm (EN) or EN 13537 is a rating system meant to keep temperature ratings in sleeping bags standardized. It is just a general guideline and comparative system and its application is optional. Most brands use it but there are some companies that don’t. Such companies will still indicate the range of temperatures their bags are made to be used in. Companies assigning their own ratings actually tend to offer more realistic temperature ratings for comfort than EN ratings which are usually on the low side. Lack of an EN rating does not mean that a bag is of inferior quality or insulation and the presence of one isn’t an indicator of superiority. When you love outdoor activities such as camping, hiking, climbing, backpacking, kayaking on a starter kayak, and mountain climbing, a sleeping bag is an essential piece of gear. Having a high quality bag adds to the overall experience. It keeps you warm and comfortable enough to sleep well. After a long day on the trail, a good night’s sleep is the ultimate luxury and it ensures you will have more fun the following day. Because sleep is very important and a sleeping bag is a long-term investment, it is always wise to get the best sleeping bag for your money. 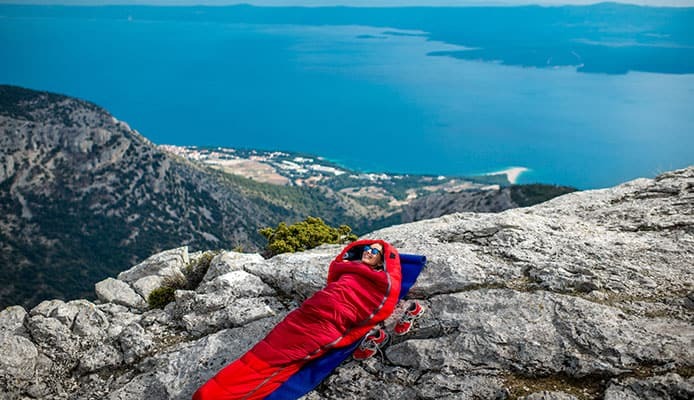 We hope our sleeping bag reviews and buying guide will help you find the best sleeping bag to fit your needs and budget. All the items in our list are high quality, lightweight, well insulated, comfortable, and highly rated for their performance. As long as you select one that suits the kind of temperatures you will be camping in, you can rest assured it will serve you well for years. For even more comfort and warmth, don’t forget spread a good ground tarp, add a sleeping pad under your sleeping bag, layer up for warmth and stay hydrated. Happy Camping! Which of the sleeping bags on our list is your top choice? We would love to read your thoughts or experience with the sleeping bags for camping we’ve reviewed! Feel free to share in the comment box below!